Tourniquet Tuesdays: that was the special at Otto’s Bar. It involved Wild Turkey and knocking somebody out while blindfolded. No one knew the origin or the point of the game, but that didn’t stop us from playing it every Tuesday night. Boredom and a looping hopelessness, that’s what drew us deep into the woods to that dive four or five nights a week, that and the hypnotic guttural tones and hilarious mispronouncements of Otto’s thick German accent. The highlight of the night would be when some fool opened the box in the bathroom marked “Do Not Open.” A bony hand reached up grasping at your essence, a creepy cure for curiosity. The transgression would set off an irritating buzzer and light up a bare bulb bolted to the back bar. We’d laugh our asses off when curiosity’s lackey returned. We spent endless hours that transformed into years, waiting and wondering who’d be drunk or stupid enough to eat one of those putrid eggs floating in a giant jar on the bar alongside the bucket of dried meat strips. Like lotus eaters, we each took our turns. A stuffed lynx collected dust from its perch amongst the liquor bottles, its yellow eyes watching us. The cuckoo bird ejaculated his accusations from a miniature black forest. The menagerie of junk that cluttered the unfinished ceiling became a slurry of yellowed brown from years of dust and cigarette smoke bellowing like an ever-present ghost. We’d write crude messages on thick cardboard coasters and sign our names to discs like celebrities, as if anyone cared that we existed. 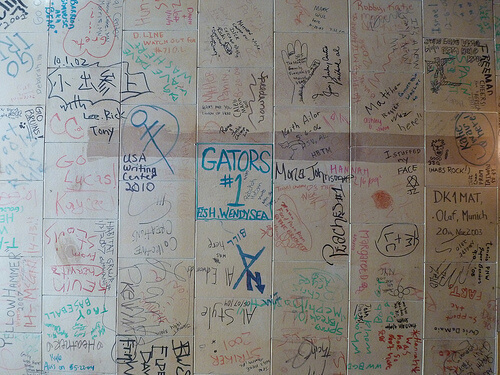 We tacked our signatures to that ceiling, nailing our fate to that spot. Otto was a sweet sadistic man. When the loneliness for his wife got too much, those were the nights he’d point a shotgun in the faces of the late night hangers-on. He’d scare the piss out of everyone and they’d stumble out to their cars and barely make it home. At least once a year, someone would misjudge the labyrinth of hairpin turns and wrap a rust-eaten truck around a tree. The smart ones would fall on the front lawn and not get up ’til noon. A couple times a year the cops would drive out to the shooting range behind the house and get Otto to stop shooting up everything and nothing. No one knew what happened to Greta. Her absence was ever-present. We suspected she might have been shriveled up like an apple doll or taxidermied and sitting in a chair upstairs, eternally waiting for another life. Maybe she was one of the lucky ones and escaped long ago. That topic was the single boundary we knew never to cross, that and asking for a glass of wine. Both would trigger Otto’s rage. His instability drew us in like Hansel and Gretel to gingerbread siding and glistening windows made of sugar. We hungered for the excitement and unpredictability of his anger, which allowed us to avoid the blunt fact that we were trapped in this turgid hole of a town. We believed in nothing. It was safer that way. Hope had a way of boggling the mind, made you think that things were possible, anything was possible. That kind of thinking tapped at you like Chinese water torture. We’d tell ourselves “this week,” no, “next month,” “when I save up a few bucks from working at the machine shop,” or “save up tips from waiting tables at the town diner,” but then the car would break down, or you had to pay for your girlfriend’s abortion or you just had to go on a two-week bender that sucked every last drop of goodness from your aching body. Otto poured the drinks, often losing track of the tab because he needed us. We drank to forget how much we needed him. Otto had always been old but somehow we got old too. Some of us married the loser sitting next to us at the bar. The lucky ones never married. We told stories about the ones who got out, went to college or married someone who went to college—dreams too painful to harbor. Those were great myths to us because we never saw those people again, like the ones who died trying to escape the treacherous woods. Hitting a tree was just another way of getting out. Tori Bond‘s short fiction has appeared in Flash Fiction Funny anthology, Monkey Bicycle, Extraordinary Gifts anthology, Wilderness House Literary Review, Every Day Fiction, Bicycle Review, and others. She earned her MFA in Creative Writing from Rosemont College. Amazing post. Are these things real? Wonderful read, Tha k you for sharing such a well written essay! Beautiful and sad. Thank you.